Encephalitis is an inflammation of the brain. It is often caused by a viral infection. The arboviruses cause encephalitis. They are passed on to people and animals by insects. Each of these viruses tends to be more common in certain parts of the U.S. Most of them are passed to humans by mosquitoes. Others may be spread by ticks. Travelers abroad are most at risk for Japanese encephalitis and tick-borne encephalitis. It also occurs less often in Republic of China (Taiwan), Singapore, and Hong Kong. In all of these areas, Japanese encephalitis is mainly a rural disease. Tick-borne encephalitis is a viral infection of the central nervous system. It is passed on by bites of certain ticks. 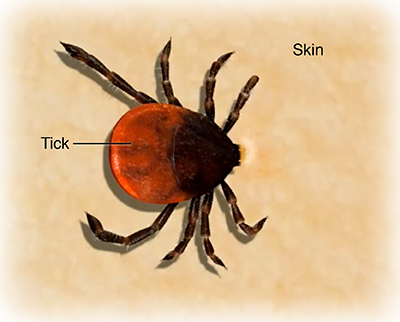 People can be infected by the bite of infected Ixodes ricinus ticks. This often happens in people who visit or work in forests, fields, or pastures. You can also get it by consuming unpasteurized dairy products from infected cows, goats, or sheep. Seizures and coma can occur in the most severe cases. The risk of getting encephalitis is greatest from April through August. This is when ticks and mosquitoes are most active. The arboviruses that cause encephalitis are passed on to people and animals by insects. In rural areas, arboviruses that are carried by mosquitoes or ticks are the most common cause of arboviral infection. The infection is often mild. But it can worsen to encephalitis. A vaccine for Japanese encephalitis is currently available in the U.S. through most travelers' clinics. The CDC recommends the vaccine only for people who will travel in rural areas for 4 weeks or more. It is also advised where there is a known outbreak of Japanese encephalitis. Wear mosquito repellents with DEET as an active ingredient. If you are traveling to rural areas, bring a portable bed net. Use permethrin, a mosquito repellent, on both the bed net and clothing. Another way to prevent encephalitis is with mosquito control. In many emergency cases, the best method is with aerial spraying. Many states may use aerial spraying to control mosquitoes. They can also spray in areas where the virus is active. After spending time in outdoor places known to have ticks, check yourself for ticks and remove them as quickly as possible. Check your pets, (especially dogs, as well. Use repellents with DEET in them. These can be put directly on skin. Encephalitis is an inflammation of the brain. It is often caused by a viral infection. Arboviruses can cause encephalitis. The viral infection is often mild. But it can progress to encephalitis. There is no treatment for encephalitis. Treatment helps relieve symptoms while the virus runs its course.